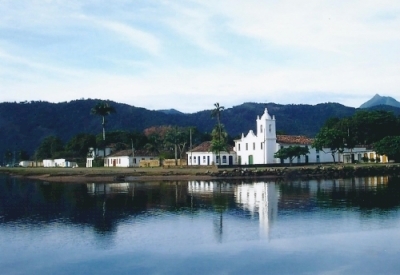 Gold Route in Parati and its landscape is part of the Tentative list of Brazil in order to qualify for inclusion in the World Heritage List. Just visited the site (March 2013). Unesco status or not it is certainly one of those places in Brazil that you just have to see anyway. Paraty is easly located between Rio (4 hours by bus) and Sao Paulo (6 hours by bus) with some frequent buses going both ways. After a flourish of 8 successful inscriptions in 3 years (1999-2001) Brazil hasn’t had a lot of luck recently. In 2003 Rio was rejected/deferred and in 2008 São Cristóvão was deferred - neither, as yet, to reappear. I wonder if its 2009 proposal of Parati (aka Paraty) will fare any better? I hope so – Latin America already has a lot of (too many?) inscribed “colonial” towns but Paraty is a gem. Not perhaps for the excellence of any individual buildings but as an undeveloped and architecturally very harmonious ensemble in a fine coastal setting. We visited in 1999, driving in down through the Atlantic Coast forests off the plateau of Minas Gerais and then out to Rio along the fine coast road. The town’s history has resulted in almost complete preservation as it was in the 18th century. Originally of great importance for the export of gold from the hinterland on what was then the only route down from the mining towns, its significance declined rapidly with the opening of new routes and new economic imperatives following independence. Its location left it cut off geographically – only accessible by sea or rough track until a road down the escarpment was built in 1954. Parati is set on a peninsular and cars are not allowed into the central area of around 50 blocks where the streets are still “rough paved”. There may have been some, but I can’t remember any, “development” to spoil the harmony. Empty of cars it may be, but not, in season, of people. The Rio-Santos/Sao Paulo highway passes a few miles to the north and it is little more than a 3 or 5 hour drive from each. Wherever we went in Brazil, people told us we had to visit this “wonderful unknown little town”. It is thus in fact very popular and WHS inscription would make it even more so! A very large percentage of the buildings now play a tourism role as pousadas, cafés, agencies, souvenir shops and art galleries – but in this it is I guess little different from many European tourist traps. Beyond seeing the town, many visitors will be there for nearby beaches and trips out to the many islands in the bay. We just enjoyed wandering the town for its atmosphere - as the photo shows, in midweek, we did find it surprisingly empty and peaceful. Brazil has, possibly unwisely, climbed on the “cultural landscape” bandwagon for Parati sensing, rightly or wrongly, that the colonial centre by itself is not enough to justify inscription – that of course raises the danger of extra complexity and opportunity for gaps in matters such as management plans and buffer zones! The T list description indicates that it is only looking for inscription on Cultural criteria – and then waxes lyrical about the neighbouring ecosystems whether coastal, marine or forest. And indeed both the surrounding area and the town itself are already inscribed as part of the Atlantic Forest Biosphere reserve. Does the inscription really need all this – after all parts of the Atlantic Forest are already WH inscribed? The description also doesn’t indicate what it is which justifies the title “Gold Route” for the landscape. No examples are given of any particular remains relating to the transport of gold beyond the town itself to justify this title. Certainly when we were there we saw no such remains and the guide books don’t refer to any beyond a trail to a nearby ranch/restaurant/zoo! Perhaps “metal routes” are also seen as a fashionable plus point to aid inscription in this same year in which Mexico is proposing a Silver and Mercury route!